Price Up, Gold Investing Up?! 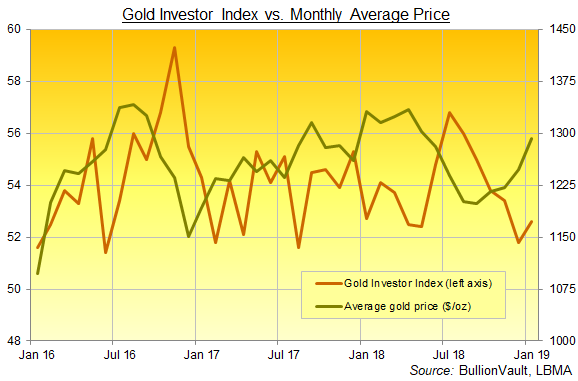 GOLD INVESTING among Western households grew last month for the first time since July, writes Adrian Ash at BullionVault, widening even as prices hit multi-month highs. That nixed an increasingly price-sensitive pattern of buying on dips and selling a spike. January marked only the second time since Donald Trump won the White House in November 2016 that private-investing interest in gold improved as the gold price rose. Last month also marked the first time since 2011 that the Gold Investor Index – a unique measure of actual behavior among the world's largest pool of people trading physical bullion online – rose in January. Typically that's a strong month for bullion prices, with gold now rising in 14 of the 20 New Years since the Millennium, inviting existing owners to sell at least a little and lock in a gain. January 2019's rise in the Gold Investor Index in fact came as the metal extended its most sustained stretch of rising prices in more than nine years. On both a month-end and daily-average basis, gold prices finished January with their fourth gain in a row for investors across the US, Eurozone and UK – a run of broad-based strength not seen since autumn 2009. 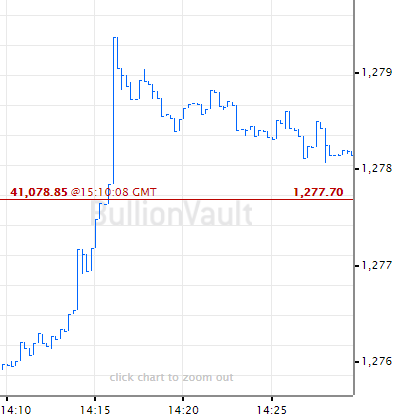 With gold prices rising to spring 2018 levels in US Dollars and near 2-year highs in both British Pounds and Euro terms, the number of private investors selling gold on BullionVault – the largest online market for physical precious metals – rose yet again last month, growing another 1.3% from December's jump to the largest total in a year. But the number of people buying gold grew faster, up 13.0% to a 3-month high at BullionVault – now caring for more than $2.0bn of client property and used by over 70,000 people worldwide to trade physical precious metals, held in wholesale-market approved bullion bars in each client's choice of London, New York, Singapore, Toronto or (most popular) Zurich. Together that boosted the Gold Investor Index for the first time in 6 months, up to 52.6 from the 16-month low of 51.8 reached in December.  Last month's reading was hardly stellar however. 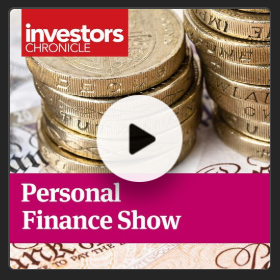 So while private investing in gold has risen so far in 2019, it remains relatively balanced overall. Yes, profit-taking by US and UK customers has now subsided as investors get used to gold trading back above $1300 and £1000 per ounce. But late-January's new 21-month highs in Euro terms above €1150 per ounce spurred a fresh wave of selling from Eurozone clients. 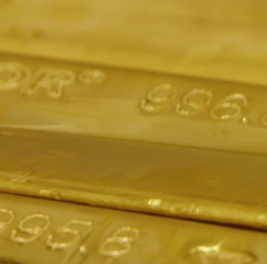 Taking the other side, new interest in precious metals from first-time gold investors jumped in January, with the number of new customers at BullionVault beating 2018's monthly average by 25.9%. Again, that's hardly stellar however. Despite the rise, January's count of new first-time investors came only 2.8% ahead of the last 5 years' monthly average. France and the United States led last month's growth among BullionVault's global client base, with the number of first-time French and US users beating their 60-month averages by 73.4% and 9.7% respectively as the gilets jaunes protests against President Macron continued and Donald Trump's budget stand-off with the Democrat-controlled House created the longest-ever shutdown of federal government services. The UK in contrast was the weakest region in January, with the count of first-time BullionVault users down 10.2% from its 60-month average despite the political impasse between London and Brussels over Brext. Silver prices also rose for US, Euro and UK investors in January, reaching summer 2018 levels and inviting a 4.3% increase in the number of sellers across the month compared to December, rising to the most since last New Year. 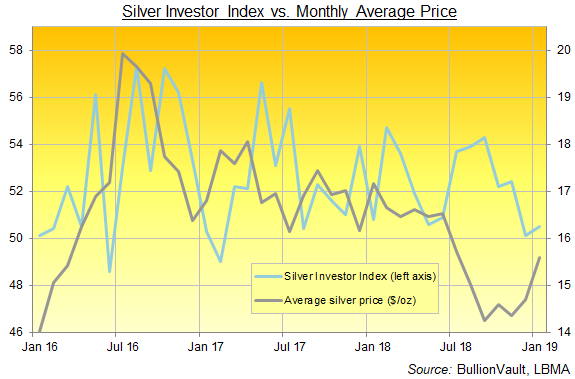 As with gold however, the number of silver buyers grew faster, up by 13.3% to a 3-month high to edge the Silver Investor higher from December's 22-month low of 50.1 to reach 50.5 in January. By weight silver found net demand of 5.1 tonnes on BullionVault, the most since last September saw the metal's price fall back to New Year 2016 levels. That took total client silver holdings to a new all-time record of 753.9 tonnes. Gold holdings in contrast retreated for a second month running, falling by 63 kilograms as selling outweighed buying and taking total client holdings – securely stored in each user's choice of London, New York, Singapore, Toronto or (most popular) Zurich – to a 3-month low beneath 39.0 tonnes. So what next? Short term, it might pay to note that February hasn't been too shabby for gold, silver or indeed platinum price gains over the last few years (if not quite as dramatic as January). Private investors using BullionVault will no doubt remain cautious on strong price rises, other things equal. But New Year 2019 has already removed or lowered the hurdles of stable stock markets, tighter monetary policy and bearish betting by speculative funds which gold faced in 2018. 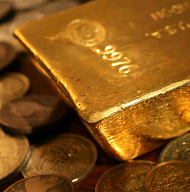 That could leave geopolitical risk – last year's key support for gold – to drive prices higher. January's straw in the wind suggests political strife and worries could boost demand even if, or maybe because, gold prices rise.